this was a 'clean out the refrigerator' dinner. i had just returned to town and didn't have time to go to the store before dinner. i explored the fridge to see what veggies the hubby had in the fridge for me to cook. we had a ton of salad fixings, like lettuce, tomatoes, carrots and cucumbers. 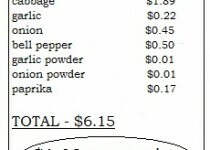 we also had some cabbage and half of a bell pepper. my first thought was to make boiled cabbage, baked chicken and a pan of homemade buttermilk cornbread. but a stir-fry sounded much easier and it was something new! now all of my genius cooks out there have to be wondering about something that i mentioned above. why didn't i throw the carrots into this stir-fry since i was cleaning out the fridge? i thought the same thing. it would have added color and a tad bit of sweetness. but i am not a huge fan of cooked carrots and i, um... got lazy. who was gonna come peel some carrots for me? 🙂 it was a very tasty, easy midweek meal that we will surely add to our rotation. preheat a large skillet over high heat and add the oil. note: i used a cast iron skillet similar to the one found here . 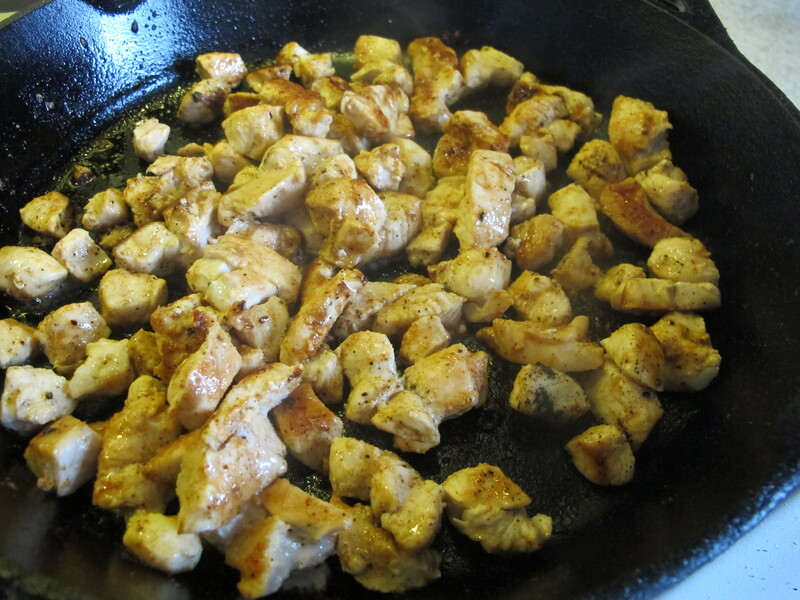 once the skillet is hot, add the chicken breasts. allow the chicken to sear by not moving it for a couple minutes. if you have a lot of chicken, cook it in batches. season the chicken (to taste) with seasoned salt and pepper. toss the chicken until cooked through and remove to a plate. allow the pan to get hot again. add the butter to the chicken drippings. 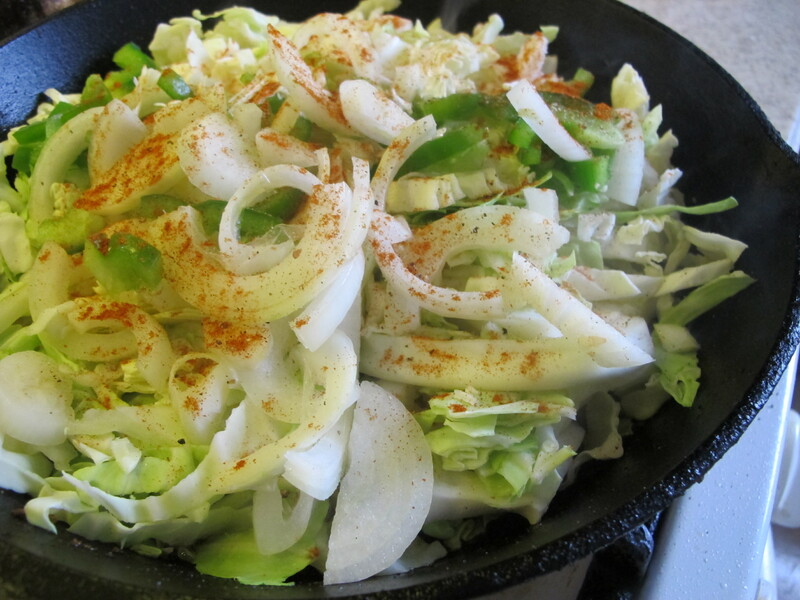 sprinkle in the cabbage, fresh garlic, onions and bell pepper into the butter. sprinkle the seasonings over, along with salt/pepper to taste. saute over high heat until desired doneness. taste for seasonings and adjust accordingly. i like to have a slight crunch on my cabbage. add the reserved chicken back in. toss until incorporated. this meal is very tasty with my homemade buttermilk cornbread or over rice. Thanks Tijuana. This looks delicious, I can’t wait to try it ! Thanks for this great suggestion! I am going to make this for our Sunday lunch, while we watch the Broncos beat the Oakland Raiders! Looks good. Have to try it sometime. I did try this recipe for dinner Tuesday evening and it was Delicious!! I am trying to lose a few pounds so I will definitely be fixing this meal again !! Thank you Tijuana for sharing such a simple and low cal recipe! I like my cabbage soft…I’m wondering about trying in a crockpot???? I just made this and shared on my fb page with a link back to you Thanks so much for sharing!! Has anyone eaten this as leftovers? wondering how the cabbage held up …. I’m a relatively new lover of cabbage (6 months) and am so glad I saw this recipe. I am almost 70 years old and feel like I’ve missed out on enjoying cabbage my entire life! Anxious to try this one as I have not tried one with chicken. Can’t wait!! Thanks for sharing! we had been on vacation eating rich meals for two weeks and when I got home I made this. Very, very delicious. Easy, healthy, and tasty. I mistakenly bought chix thighs but they were fine. I also had to add a lot of vinegar as per hubbys request. (he will only eat cabbage with vinegar). I will definitely make this again!!! I am going to try this recipe this week, it looks delicious. I will halve everything as there is only the 2 of us. One of your respondents used vinegar, did they mention how much? I will add a splash. Made this for dinner tonight and it was so yum! Even my oh so picky eater Granddaughter loved it. Made a nice batch of Corn Bread to go with it. Thanks so much for sharing it! I made this for dinner tonight. Since I didn’t have the onion or pepper, I used frozen cubes of Puerto Rican sofrito that I had. It was delicious. Thank you for sharing this quick and easy recipe. Hello my darling friend I’m making this this week. Keep up the great work and helping me figure out what different to cook. Love you for life. This looks soooooo yummy!!!! I wonder if adding sausage or bacon would be good as well…..I love extremely hearty dishes!! I made this tonight I thought it was real good. I did not use onion or garlic powder or veg oil Other than that everything was the same. 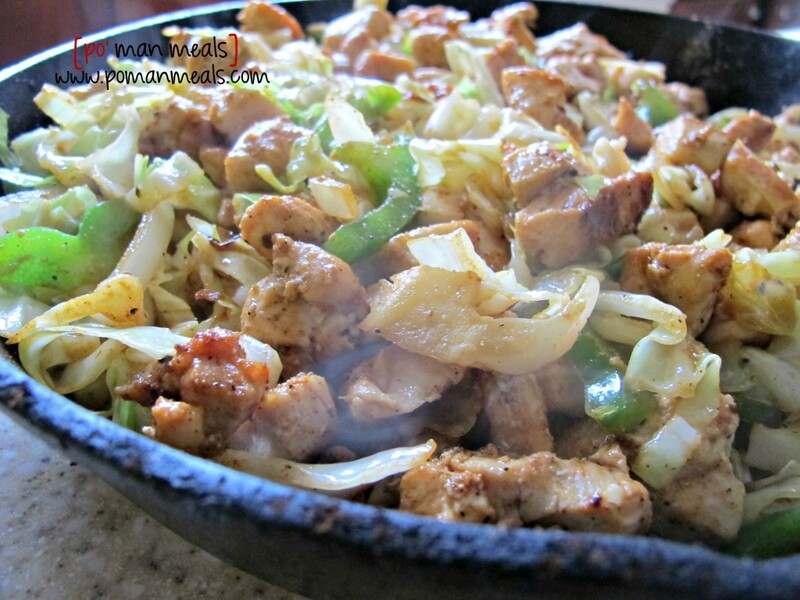 Never thought of chicken and cabbage together but it was very yummy!!!! Has anyone made this without the cast iron skillet? I don’t think mine is large enough ???? Omgosh!! THIS IS AMAZING!! Seriously! I love it!!! Thanks so much for sharing!! Just made this tonight and it is delicious!!! I’m eating now as I type this. Thank You it was delious.